Jay Rayner has clearly had a better upbringing than me; in his review of The White Swan, he’s quite dismissive of Fence, the small village near Burnley in which it’s set. I’m sure he was exaggerating to make a point, and it is fairly unassuming. But from the bits I saw it looked like quite a charming area. 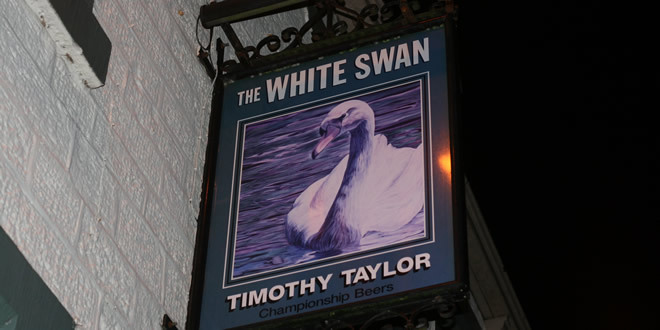 Including The White Swan itself, a traditional and very inviting looking village pub. The inside is just as appealing. With a cosy looking bar area to the right and a homely dining room on the left, where we settled and warmed from the bitter January night. 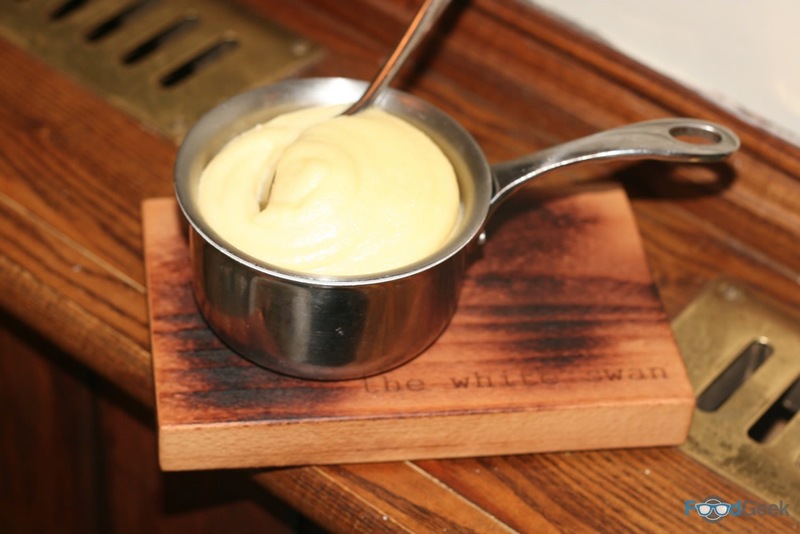 While it was Jay Rayner’s review that first alerted me to The White Swan, it wasn’t the main reason I made the trip. 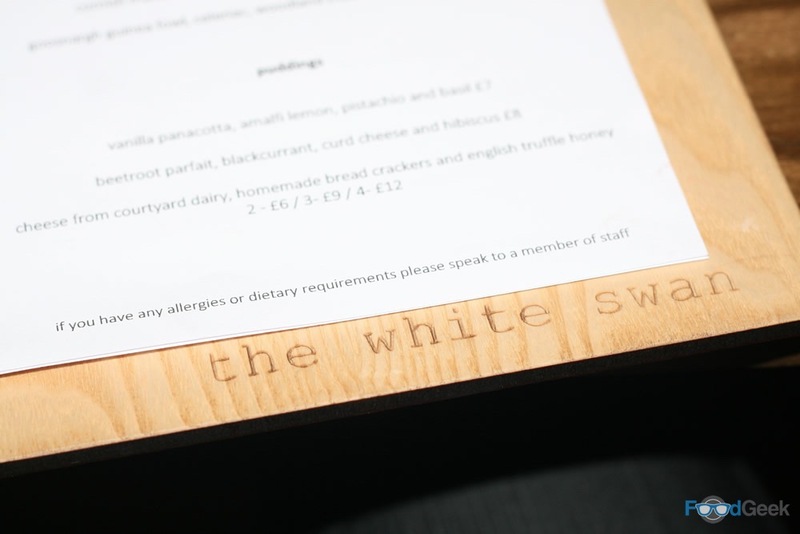 I’m naturally drawn to slightly unexpected places producing quality food at great prices, which is what The White Swan seemed to offer. I also love that there’s no set menu, it changes daily depending on the available produce. 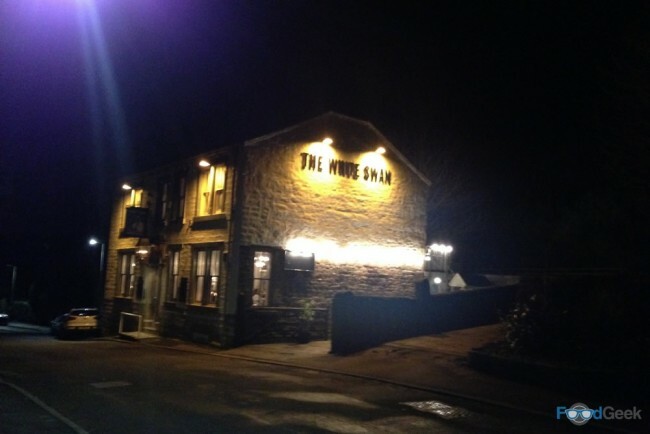 As if that wasn’t enough it’s listed in the Good Food Guide and has earned a Michelin Bib Gourmand and two AA Rosettes. Not bad for a local pub! Especially when you consider head chef Tom Parker is just 25 years old. He does have good pedigree though having trained at Michelin-starred Northcote, just 10 miles down the road. So, I was already sold on the location, decor and friendly service but things really got interesting when the food arrived. 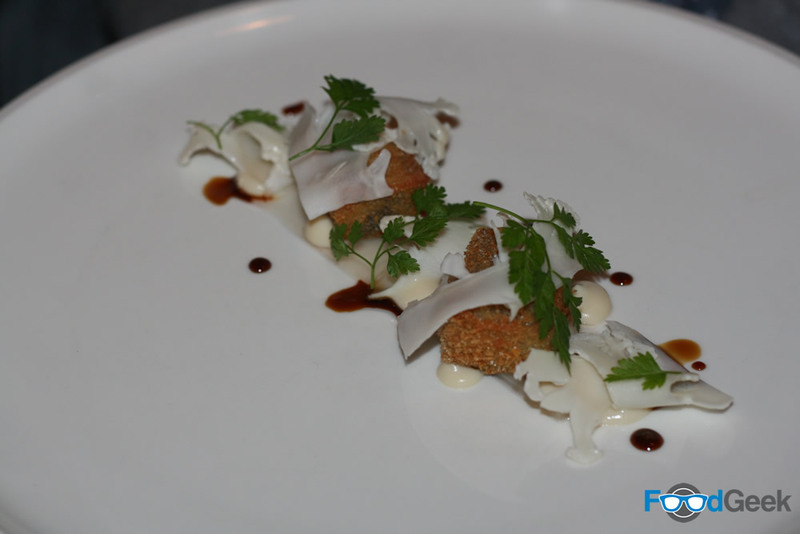 Our beautifully plated starters consisted of melt in the mouth ‘Pigs head nuggets’, served with delicate slices of wafer thin, pickled cauliflower that cut through the meaty nuggets and fatty lardo perfectly. 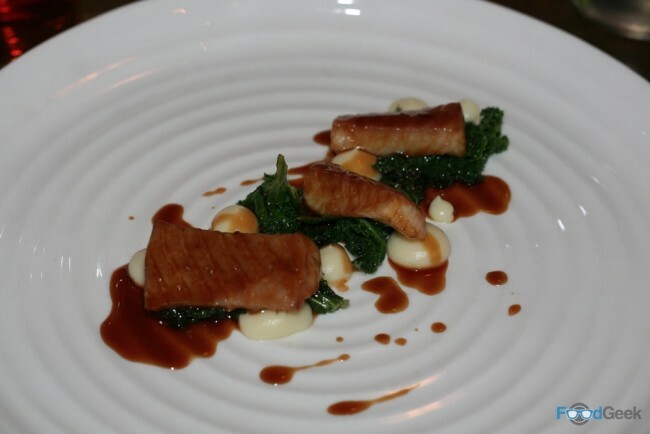 And gorgeous ‘Smoked eel’ with charred kale, parsnip puree and a rich veal jus. A delightfully refined ‘surf ‘n’ turf’. Main courses were equally good. Although, I worried that the ‘Guinea fowl’ looked a bit dry at first. It wasn’t. In fact, it was the tenderest, juiciest, most succulent meat imaginable. And just brilliant with the baked celeriac, wild mushrooms and lovage. 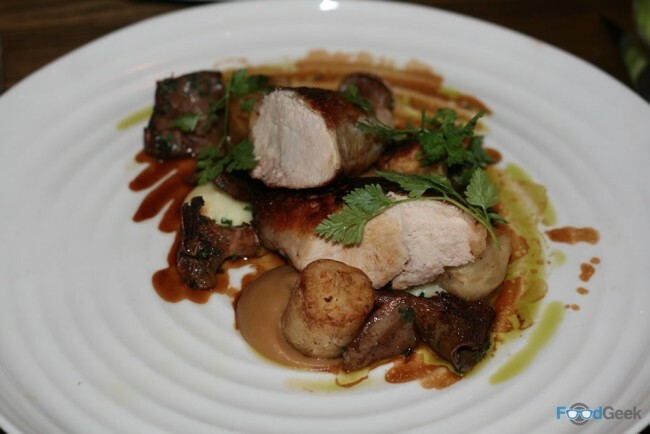 A beautiful combination of earthy flavours that worked in perfect harmony, all held together by a wonderfully rich sauce. You can’t tell just how rare the deer was from this photo but it was incredible. A well-seared char on the outside with wonderfully soft, pink juicy meat inside. Again the combination of flavours were fantastic and the stunning meaty jus did an excellent job of bringing each element together. 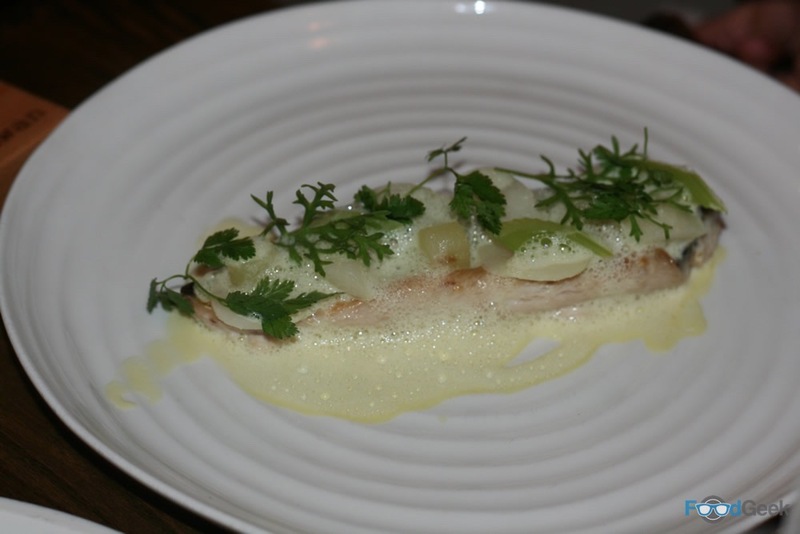 The ‘Cornish Mackerel’ was similarly excellent. More subtle than the meat dishes, in fact, incredibly light and delicate but an equally well-balanced combination of flavours. The main courses were served with the richest, smoothest, butteriest mash I’ve had for a long time. A sign of a good restaurant is the quality of their desserts. 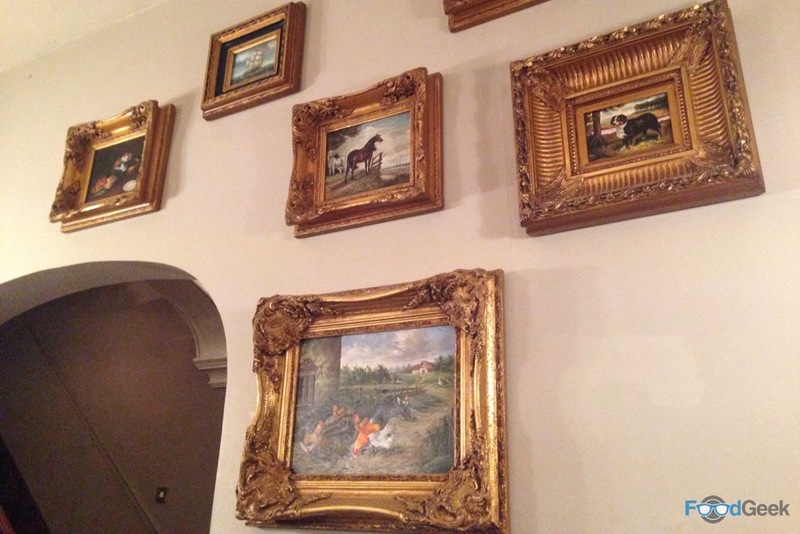 It’s so often obviously an afterthought, but not at The White Swan. 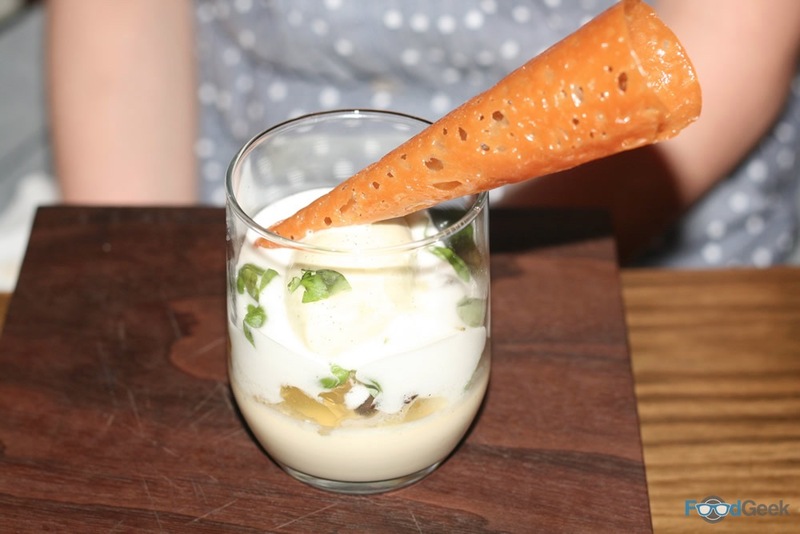 Although it always slightly disappoints me to see a pannacotta served in a glass/bowl, I like them turned out to show off their wobble. All was forgiven after one heavenly mouthful, however. The combination of sweet cream with Amalfi lemon, pistachio and basil is intriguing and utterly delicious. 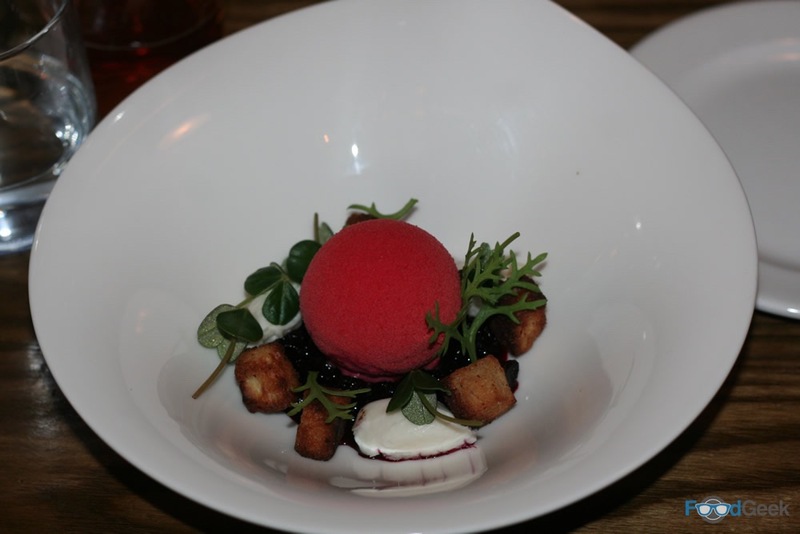 The ‘Beetroot Parfait’ was better still. 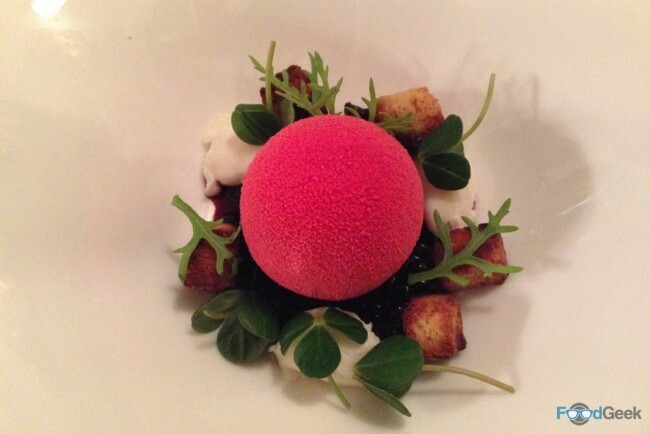 A perfect sphere of pink parfait was served with fresh blackberries, curd cheese and a gorgeous hibiscus sauce. The earthy, almost savoury flavours made for a highly unusual dessert but one I very much enjoyed. We finished with one of the best cheeseboards I’ve seen for a long time. 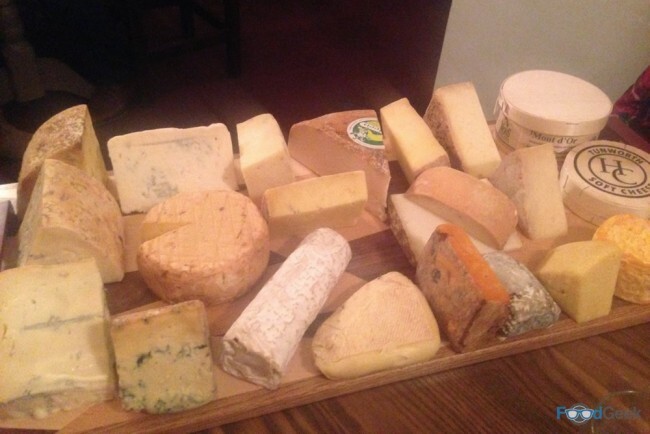 A fantastic range of cheeses from the Courtyard Dairy covering all the bases. The highly knowledgeable waitress went through them all in great detail. The only problem was having to choose just four. 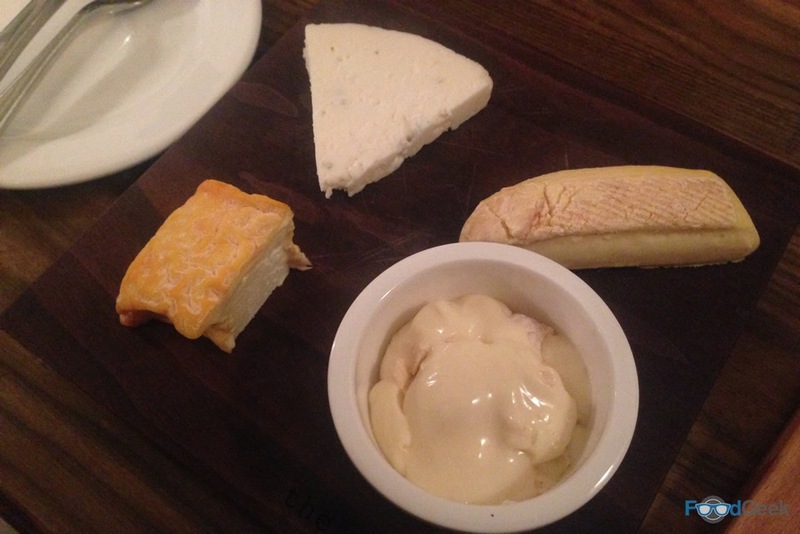 Eventually, we went for: Petit Langres, Rollright, Beenleigh blue and one of my favourite cheeses in the world, the unctuous, gooey delight that is Mont D’or. 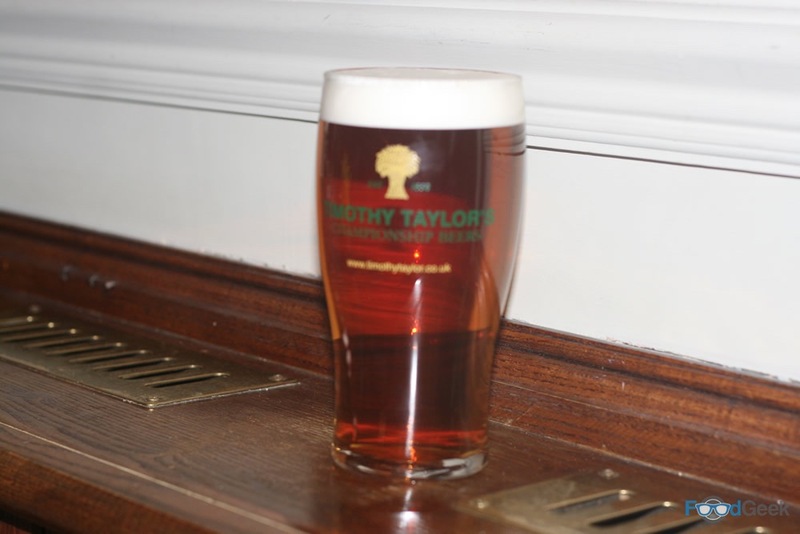 It’s not just the food that is great at The White Swan. There’s an excellent wine list too, apparently the owners also run a wine shop which obviously helps. 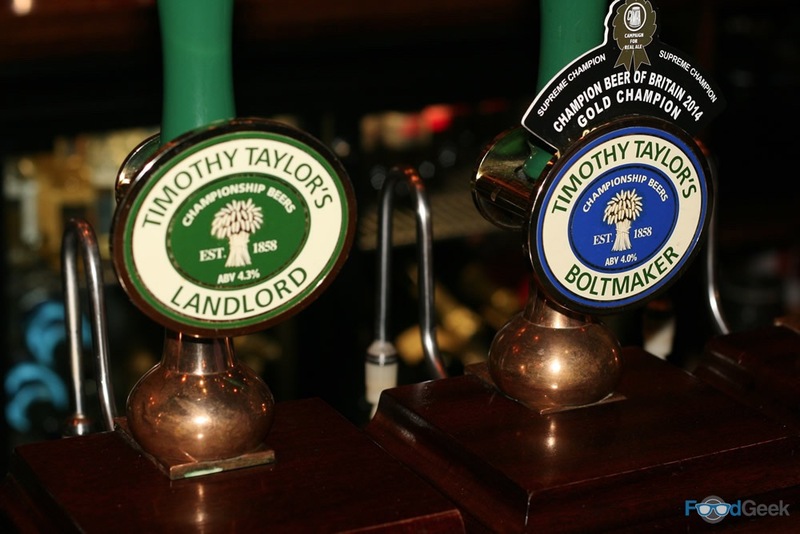 And as the only Timothy Taylor pub in Lancashire, there’s well-kept cask beer too. 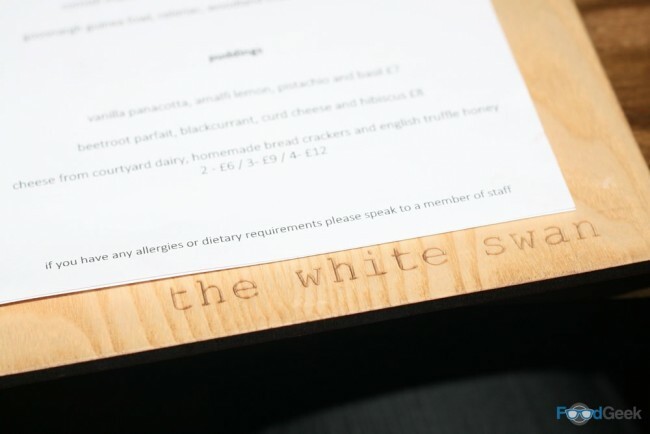 While I may hold the village of Fence in higher regard than Jay Rayner, I’m totally with him on The White Swan. I adored everything. 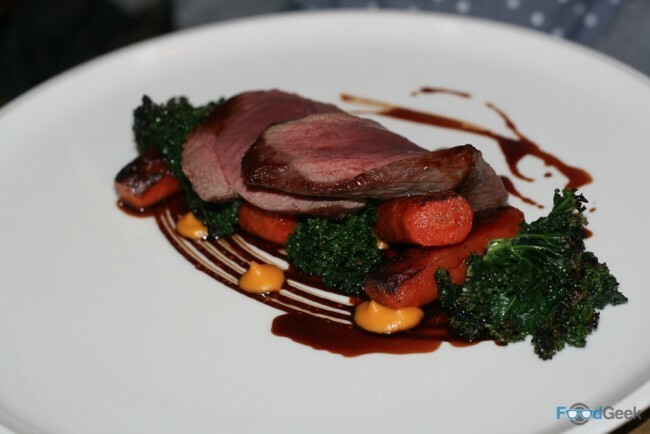 Not just the brilliant food – though it is; from the quality of ingredients and expert cooking to the clever combinations of flavours that elevate seemingly simple dishes to a higher level – but also the efficient yet friendly service, the relaxed atmosphere and the fantastic value. What I wouldn’t give to have somewhere like that as my local. It’s up there with the likes of Sticky Walnut and the Parkers Arms for me as somewhere producing a far higher standard of food than you might expect, unfussy but at the same time fascinating and flawless.